I’ve been chasing this shot for a while now and finally got it last night. 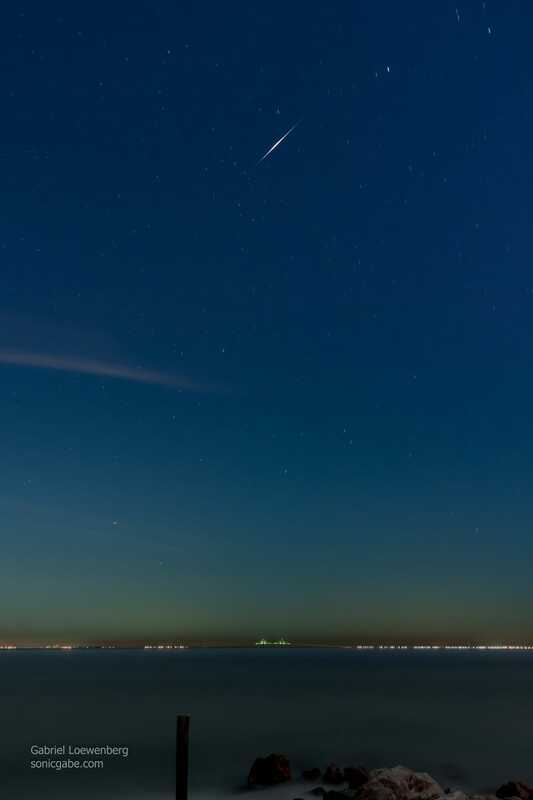 This is an Iridium Flare from the left antenna of Iridium 32 as it passed overhead last night. I shot this from Anna Maria Island because from this spot, the flare would appear directly over the Sunshine Skyway Bridge, which is about 7.5 miles away. I thought I was going to get a pier in the foreground to the right, pointing out over the water towards the bridge. Nope. It was damaged beyond repair in Hurricane Irma in 2017 and completely torn down last year. I had no idea. Oh well. My other attempts at getting an Iridium Flare all failed. Clouds, timing, sleep, the satellite not existing any more. When I was searching for a place to shoot this one and I realized I could line it up with the bridge, I knew this would be the one that worked. I kinda wish it would have been lower in the sky so I could have zoomed in a bit to get the bridge larger in frame. No worries. I think I might have the chance to get that in the near future. The flares are produced when sunlight reflects off of one of the satellite’s antennas, which are about the size of a door in your house. Depending on your proximity to the satellite, the flares will vary in brightness. This particular pass, from this spot, had a brightness magnitude of -8.0, which is really bright. It’s a pretty amazing sight to see this little moving dot all of a sudden become the brightest thing, by far, in the night. This reflection came from a door-sized panel that was 661 miles away traveling about 16,690 miles per hour. This picture is a single 93-second exposure at 18mm, f/8, and ISO 250. It was edited in Photoshop and Lightroom. Sadly, this is a phenomenon that is not long for this world. The next generation of Iridium communication satellites are taking over and they do not produce flares. The old satellites are being deoribted. Of the original 95 satellites, only a few remain operational as back-ups for the new ones. At some point, the last of the original Iridium satellites will be no more. But until then, you can still catch one of these if you look in the right place at the right time. A great resource for finding things in the sky is heavens-above.com.